Finding the best French door refrigerator for your home means reading reviews, studying product features, and diving into the ins and outs of available upgrades and refrigerator configurations. With the right French door refrigerator, safely storing and having easy access to your food can become a quick, over-and-done with task. We reviewed dozens of French door refrigerators to identify the best of the best, based on Amazon reviews, how well they performed in performance tests, cost, and other considerations. We narrowed our search down to 5 of the top-rated French door refrigerators homeowners can purchase to ensure a healthy and happy kitchen. 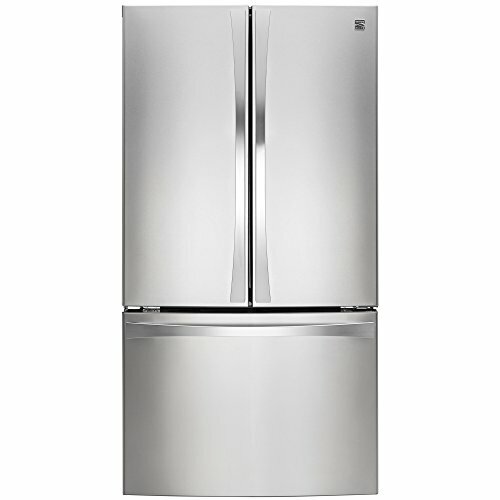 We’ve identified the Kenmore Elite 73153 French Refrigerator as the best French door refrigerator out there. With plenty of space to store your perishables and a built-in water dispenser, this French door refrigerator is one that will keep your entire family in tip top shape. These benefits allow you to prepare healthier meals in less time, and keep the foods you buy fresher for longer. The Kenmore Elite 73153 French Refrigerator earned the top spot on our list of the best French door refrigerators, as it provides plenty of storage space — 28.7 cubic feet to be exact — along with smart features to help keep food fresher longer. This fridge uses digital temperature controls, electronic sensors, and multi air flow to provide optimum temperature performance for storing your perishable items. The tilting freezer door makes accessing food from one of the three baskets a cinch. Those who purchased and reviewed this French door refrigerator appreciated that this fridge provided so much storage space for their foodstuffs. Several reviews made mention of how the fingerprint-resistant finish stood up to even touchy toddlers, and overall people found the materials used in construction to be quite sturdy. With a price tag of around $2,100, it is an average price for a French door refrigerator, and the quality craftsmanship associated with the brand, as well as the ease of setup and use more than justifies that price. It has a rating of 4.1 on Amazon with more than 100 people reviewing it, which we think goes a long way in convincing homeowners to make the investment. 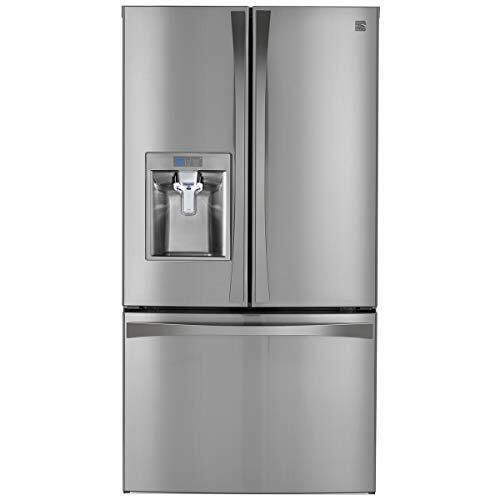 The Kenmore Smart 75043 French Door Refrigerator has everything you want in a fridge: plenty of storage space, integrated water dispenser and ice maker, and a filter system to remove odors. It also features smart technology that allows homeowners to monitor and control things like temperature and airflow all from their wireless device. It’s even compatible with Amazon Alexa. The recessed LED interior lighting makes it easy to find what you’re looking for. Those who purchased and reviewed this French door refrigerator appreciated the amount of space this refrigerator offers, combined with the flexibility of layout. Several commented on the convenience of the digital temperature readout, saying it is an improvement over old models. At a cost of around $2,500, it doesn’t come cheap, but the quality craftsmanship associated with the brand, as well as the ease of setup and use more than justifies that price. It has a rating of 4.1 on Amazon with more than 100 people reviewing it, which we think goes a long way in convincing homeowners to make the investment. The Kenmore 73025 French Door Refrigerator is our pick for the most budget-friendly French door refrigerator, with a price tag of around $1,000. Even at this reasonable price, it still offers 26.1 cubic feet of storage capacity, and boasts a full-width pantry drawer that’s ideal for storing items such as veggie trays and party platters. Gallon-sized door bins make storing juice, milk, and other containers hassle-free. Those who purchased and reviewed this French door refrigerator appreciated that it offered so much storage space in such an affordable package. While some were disappointed that this model did not include an integrated water dispenser, it’s easy to overlook for the bargain this unit provides. With a price tag of around $1,072, this French door refrigerator is a solid choice for those looking for a French door refrigerator option on a budget. It has a rating of 4.1 on Amazon with more than 100 people reviewing it, which we think goes a long way in convincing homeowners that this budget-friendly pick is just as good at keeping food fresh as its more expensive counterparts. The Kenmore Elite 74013 French Door Refrigerator offers a mind-blowing 30.6 cubic feet of storage space that can easily keep up with the needs of the hungriest family. Features such as dual evaporators, electronic sensors, and vents that evenly distribute cold air to every nook and cranny means foods stay fresher longer. The full-width pantry drawer has its own digital temperature controls that can be custom set for meat, deli, or produce items. Those who purchased and reviewed this French door refrigerator appreciated its ample storage space, and liked how well-lit the unit was with its LED lighting. One reviewer commented on how convenient the tilting freezer door and multiple levels of shelves made it to get items in and out of the freezer — always a plus. At a cost of approximately $3,200, it doesn’t come cheap, but the quality craftsmanship associated with the brand, as well as the ease of setup and use more than justifies that price. It has a rating of 4.1 on Amazon with more than 100 people reviewing it, which we think goes a long way in convincing homeowners to make the investment. The Haier HRF15N3AGS French-Door Refrigerator is our choice for the best French door refrigerator for small spaces, thanks in large part to its 28-inch width. Most French door refrigerators carry a fairly wide footprint that makes installing them in small spaces a real hassle. While it does fit well into smaller kitchens, it’s a trade-off in the storage department as it can only hold 15 cubic feet. Users can adjust the temperature in one-degree increments thanks to the electronic temperature controls. Those who purchased and reviewed this French door refrigerator appreciated that it had a quiet operation, and found it easy to clean. One comment mentioned how bright the interior lighting was, which made it easy to find desired items. More than one reviewer mentioned how well this unit kept fingerprints at bay. At a cost of around $993, it’s fairly inexpensive as far as French door refrigerators go, especially considering it’s a “specialty” item due to its narrow width. The quality craftsmanship associated with the brand, as well as the ability to have a French door refrigerator option that will work in a small kitchen, more than justifies that price. It has a rating of 3.3 on Amazon with nearly 10 people reviewing it, which we think helps to convince homeowners that this compact option is worth considering in kitchens where space is a real issue. A French door refrigerator is an ideal choice for those who want to keep their most frequently eaten foods at eye level. Because the fridge portion is on the top and the freezer on the bottom, you can easily see what’s in stock. They also offer more storage space than their traditional counterparts, which makes them ideal for families. Their layouts are also conducive to keeping items organized, with their many shelves and in-door storage bins. A French door refrigerator also provides better clearance in the kitchen. A full-sized door needs more room to open and close, but a French door refrigerator cuts that space in half, making it an ideal choice for more compact kitchens. Finally, a French door refrigerator is great for those who want to cut down on their energy consumption. Since you only need to open one door at a time, you let less cool air out, meaning overall lower operating costs. Width. Arguably the most important consideration when choosing a French door refrigerator is the width of the unit, as you’ll want to make sure it will fit in your kitchen space. Measure carefully to avoid any disappointment, and ensure there is enough clearance for the door to open and close fully. Capacity. The next most important consideration when shopping for a French door refrigerator is the capacity. There are more compact models (less than 20 cubic feet of storage) that are ideal for singles and two-person households, and there are other units with large storage capacity or 28 or more cubic feet. For most households, somewhere in the range of 25 cubic feet storage capacity should be enough to handle most needs. Shelves. Many shelves are adjustable or removable to help you get just the right configuration for your needs. While some are made from plastic, others use tempered glass for a more durable (and safe) finish. Features. Additional features such as rapid cool, built-in ice makers, or integrated water dispensers are not must-haves, but can be nice options if you have some room in your budget for them. Finish. Stainless steel is the most popular choice for its neutral, unifying look. You can even get models in black stainless these days for an even more contemporary look. Black and white appliances complement many kitchens, and tend to be less expensive than their stainless steel counterparts. Another important factor for a refrigerator’s finish is whether or not is is fingerprint-resistant. Noise. Since a refrigerator is always plugged in, you’ll want to find a model that is quiet. Third party testing has found that Kenmore, LG, and Samsung are among the quietest brands. Price point. Finally, consider how much you are willing to spend on a French door refrigerator. French door refrigerators vary in price from about $1,000-$3,000 or more. You can frequently find discounts around holidays such as Black Friday or during year-old model clearouts that can make buying a French door refrigerator more affordable. 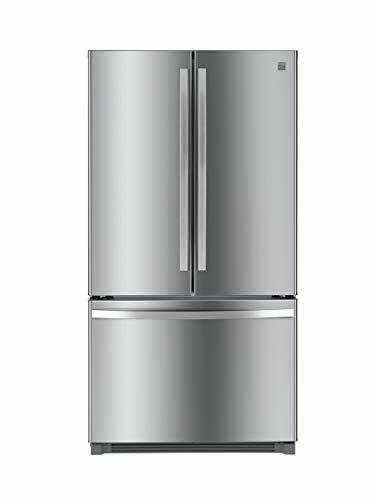 A French door refrigerator is a refrigerator with two doors on the fridge portion of the appliance, and generally a single door (or drawer) on the bottom. A French door refrigerator is also sometimes referred to as a three door (or four door) refrigerator. Are top freezers more efficient? Top freezers more efficient than other freezer types. In fact, the U.S. Department of Energy has found that refrigerators with top freezers use approximately 10-25% less energy than refrigerators with bottom freezers. A French door refrigerator still uses less energy than a side-by-side refrigerator though. Do French door refrigerators have more space? French door refrigerators give the illusion of more space, thanks to their two door design. The narrow doors can be opened fully without swinging as far into the kitchen as a fridge with a full-sized door. This makes them an ideal choice for kitchens that are tight on space, or where people might be walking around and behind one another while cooking. This simple design change is a favorite as it does not sacrifice on the interior space available in the fridge — it’s still a full-sized fridge and offers the same level of storage capacity as other styles. Do French door refrigerators work in small kitchens or small spaces? French door refrigerators can work in small kitchens, with some design considerations in mind. First, if your kitchen has a space for the refrigerator, and it’s between two cabinets, you might have a hard time finding a French door refrigerator to suit your space. They are some narrow-width models available, but they tend to come at a premium price or with smaller storage capacity. If your fridge sits at the end of your cabinets or counter, or freestanding elsewhere, you’ll have more options when it comes to installing a French door refrigerator in a small space. If your kitchen is small, you should also check out our review of the best small microwaves. We looked at 20 other French door refrigerators. Even though they didn’t make our 5 best French door refrigerators list, they’re the best of the rest and each is still a great option for your kitchen. The information you’ll need to compare each one is included with the listing. Prices are estimated based on Amazon at the time of writing and are subject to change. This French door refrigerator boasts 26.8 cubic feet of storage capacity and comes complete with a built-in water dispenser and ice maker. This French door refrigerator boasts a 24.8 cubic foot storage capacity, and features an internal water dispenser to help keep the outside looking streamlined. This French door refrigerator boasts a whopping 29.8 cubic foot storage capacity, and features a sleek black stainless steel finish that is fingerprint-resistant. This French door refrigerator offers 28.8 cubic feet of storage space, and comes complete with a unique crisper drawer system with three separate storage spaces. This French door refrigerator offers 21.7 cubic feet of storage capacity, making it an ideal size for singles or those with less storage needs. This French door refrigerator offers 26.1 cubic feet of storage space, and features a dual evaporator system that helps to keep the fridge and freezer at ideal temperatures. This French door refrigerator offers a massive 30 cubic feet of storage that’s ideal for even the biggest eaters, and includes an impressive three-tier water filtration system. This French door refrigerator boasts 24.2 cubic feet of storage space, and comes complete with four split adjustable glass shelves, two crisper drawers, and adjustable door storage to suit any household’s needs. This French door refrigerator boasts a 25 cubic foot capacity, and utilizes a unique air flow system to help keep foods cool and fresh. This French door refrigerator offers 27 cubic feet of storage capacity, and features a unique door-in-door design that helps to reduce energy consumption. This French door refrigerator offers 24.7 cubic feet of storage capacity, and features adjustable glass shelves to suit any family’s storage needs. This French door refrigerator offers 20.1 cubic feet of storage capacity, and features a two-drawer freezer system which provides better organization. This French door refrigerator offers 22 cubic feet of storage capacity, and features a unique integrated family hub system to help manage your family’s activities. This French door refrigerator boasts a 20.6 cubic foot capacity, and features a counter-depth design that allows it to nicely fit into smaller-sized kitchens. This French door refrigerator offers 22.6 cubic feet of storage space, and features a unique flex zone drawer which sections off food to cool at different temperatures. This French door refrigerator boasts 20 cubic feet of storage capacity, and uses a special ExtendFresh temperature management system in order to help keep foods at their freshest for as long as possible. 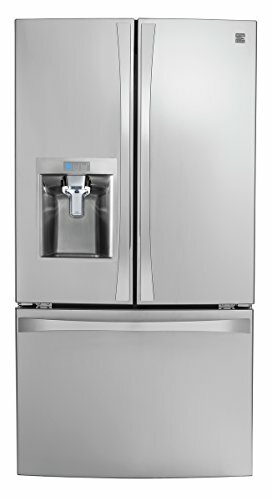 This French door refrigerator provides 22.5 cubic feet of storage space, and features a unique four-door design that makes it ideal for use in spaces where door swing is an issue. This French door refrigerator boasts 20.7 cubic feet of storage capacity, and uses a retractable self system to help create space for taller items. This French door refrigerator offers 21.5 cubic feet of storage space, and features a unique Sabbath mode, door open alarm, and electronic temperature controls. This French door refrigerator boasts a 23.8 cubic foot storage capacity, and is the largest capacity counter-depth refrigerator in its class.